MR.  GIFFORD was originally bred to some handicraft. He afterwards contrived  to learn Latin, and was for some time an usher in a school, till he  became a tutor in a nobleman&apos;s family. The low-bred, self-taught man,  the pedant, and the dependent on the great, contribute to form the  Editor of the Quarterly Review. He is admirably qualified for  this situation, which he has held for some years, by a happy combination  of defects, natural and acquired; and in the event of his death it will  be difficult to provide him a suitable successor. Mr.  Gifford has no pretensions to be thought a man of genius, of taste, or  even of general knowledge. He merely understands the mechanical and  instrumental part of learning. He is a critic of the last age, when the  different editions of an author or the dates of his several performances  were all that occupied the inquiries of a profound scholar, and the  spirit of the writer or the beauties of his style were left to shift for  themselves, or exercise the fancy of the light and superficial reader. In studying an old author, he has no notion of anything beyond adjusting  a point, proposing a different reading, or correcting, by the collation  of various copies, an error of the press. In  appreciating a modern one, if it is an enemy, the first thing he thinks  of is to charge him with bad grammar: he scans his sentences instead of  weighing his sense; or if it is a friend, the highest compliment he  conceives it possible to pay him is, that his thoughts and expressions  are moulded on some hackneyed model. His standard of ideal perfection is  what he himself now is, a person of mediocre literary attainments: his  utmost contempt is shown by reducing anyone to what he himself once was,  a person without the ordinary advantages of education and learning. 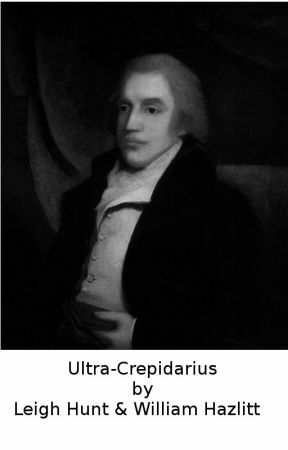 It  is accordingly assumed with much complacency in his critical pages, that  Tory writers are classical and courtly as a matter of course, as it is a  standing jest and evident truism that Whigs and Reformers must be  persons of low birth and breeding, imputations from one of which he  himself has narrowly escaped, and both of which he holds in suitable  abhorrence. He stands over a contemporary performance with all the  self-conceit and self-importance of a country schoolmaster, tries it by  technical rules, affects not to understand the meaning; examines the  hand-writing, the spelling, shrugs up his shoulders and chuckles over a  slip of the pen, and keeps a sharp look-out for a false concord and-a  flogging. There  is nothing liberal, nothing humane in his style of judging: it is  altogether petty, captious, and literal. The Editor&apos;s political  subserviency adds the last finishing to his ridiculous pedantry and  vanity. He has all his life been a follower in the train of wealth and  power, strives to back his pretensions on Parnassus by a place at court,  and to gild his reputation as a man of letters by the smile of  greatness. He thinks his works are stamped with additional value by  having his name in the Red-Book. He looks up to the distinctions of rank  and station as he does to those of learning, with the gross and  over-weening adulation of his early origin. All his notions are low,  upstart, servile. 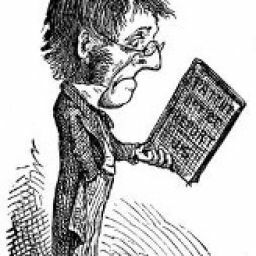 He thinks it the highest honour to a poet to be  patronised by a peer or by some dowager of quality. He is prouder of a  court-livery than of a laurel-wreath; and is only sure of having  established his claims to respectability by having sacrificed those of  independence. He is a retainer to the Muses, a door-keeper to learning, a  lacquey in the State. He believes that modern literature should wear  the fetters of classical antiquity; that truth is to be weighed in the  scales of opinion and prejudice; that power is equivalent to right; that  genius is dependent on rules; that taste and refinement of language  consist in word-catching. Many  persons suppose that Mr. Gifford knows better than he pretends, and  that he is shrewd, artful and designing. But perhaps it may be nearer  the mark to suppose that his dulness is guarantee for his sincerity, or  that, before he is the tool of the profligacy of others, he is the dupe  of his own jaundiced feelings and narrow, hoodwinked perceptions.